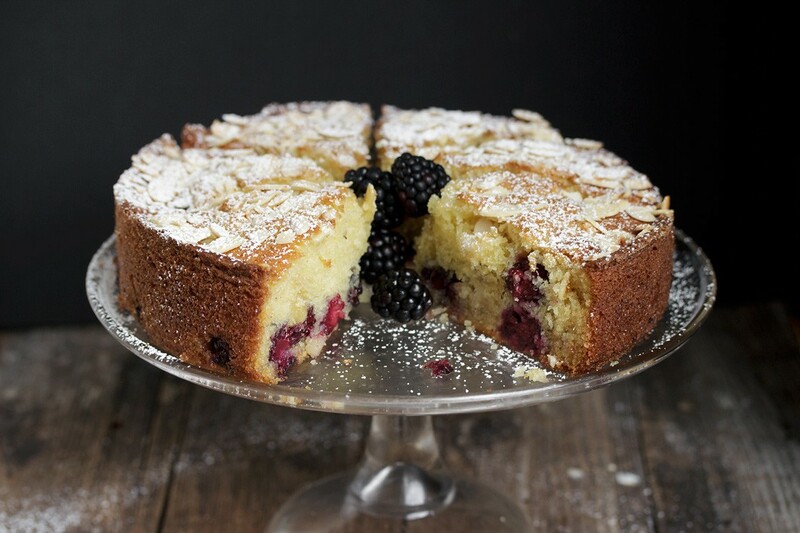 A moist but light fresh Blackberry Almond Cake, flavoured with a delicious almond topping. Not overly sweet, so it’s perfect to enjoy any time of day. Would be great with any fruit! My baking activities certainly slow down in the warmer months, but they never stop completely. In summer, I love to bake with fruit and I love cakes like this one that are perfect to enjoy any time of day. I also love that I can use this same cake batter with any kind of summer fruit! For this one, I started with some big, beautiful blackberries. The fruit is sprinkled over the top of the batter and sinks in to the cake as it bakes. That sinking thing is why you can’t put the almonds on top until it’s baked a bit and set up. The almonds are in the oven long enough though to perfectly toast and add great crunch and flavour to this cake. 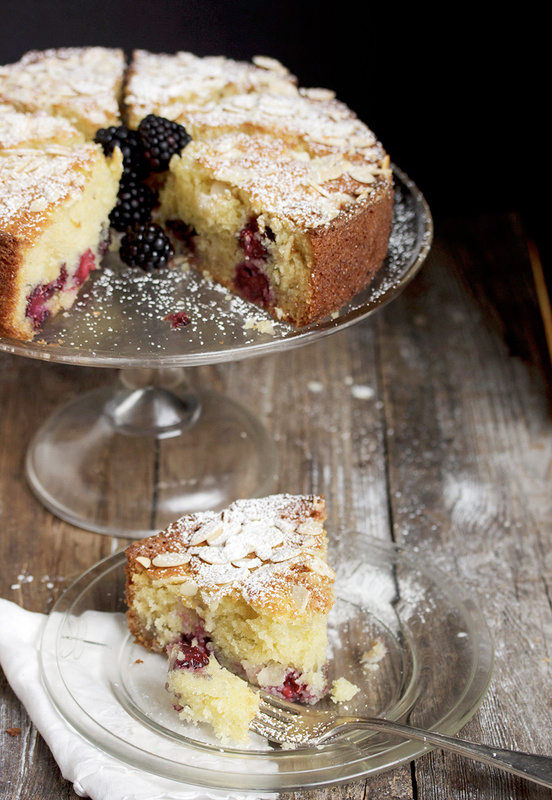 This blackberry cake is quite moist, especially when freshly baked. It keeps well for several days, but will dry out a tiny bit the longer it sits. Don’t hesitate to make it ahead though, as it keeps very well. To dress it up for a summer dessert, serve with a dollop of whipped cream or creme fraiche. I have provided imperial measurements, but if you have a scale, use the gram measurements for best accuracy. This cake would be lovely with any fruit! Preheat oven to 350 ° F. with rack in centre of oven. Grease an 8 or 9-inch springform pan and line the bottom with a circle of parchment paper. In a large bowl with a hand mixer of the bowl of your stand mixer with the paddle attachment, cream the butter until light and fluffy. Add the sugar and beat until light and fluffy. Add the eggs, one at a time, beating well after each addition. Add the vanilla and yogurt and mix to combine. In a medium bowl, whisk together the flour, baking powder, baking soda and salt. it. Add to bowl with batter and mix to combine. Add batter to prepared pan and level. Sprinkle blackberries evenly over the top of the batter. 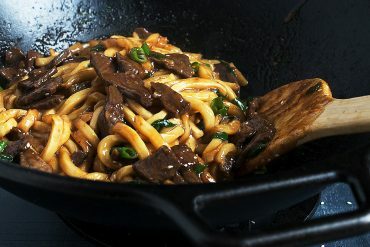 Place springform pan on a baking sheet and bake in to the pre-heated oven for 30 minutes. Gently remove cake from oven and sprinkle sliced almonds evenly over the top. Sprinkle with sugar. Return to the oven and continue baking an additional 25-30 minutes, or until a cake tester comes out clean. (*If cake or almonds are darkening too quickly, cover the top loosely with a piece of aluminum foil for the last part of baking. Allow to cool in pan for 10-15 minutes, then run a knife around the outside of the cake and remove the outer ring. Allow to cool completely before removing cake from bottom of springform pan. 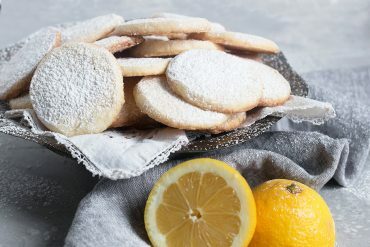 Serve garnished with powdered sugar. Also nice served with a dollop of whipped cream, creme fraiche or ice cream. For this cake , if using blueberries would I still scatter them on top of batter or fold them in? Hi Michele, I would just scatter on top. They should sink in just like the blackberries do. THis cake is just lovely!! Have been wanting to back a cake with blackberrys for the longest time! Will be making this maybe tomm. Will sub in some almond flour too!! Love your pic of this cake, thanks so much!! Thanks so much, Michele. Enjoy! What are the red things in the cake?….it doesn’t say? That cake look so incredibly moist! Such a lovely flavour combination too. I want some now!! Wow, great job on the presentation of this cake also! It looks delicious and I do love a cake that’s not over the top sweet. This cake looks divine. The edges look crunchy and the inside looks fluffy and light, so gorgeous.. I want it with raspberries please and thank you :) I am so pleased to have discovered your blog. Your photos are stunning. Gorgeous cake and beautiful pictures! Pinned! 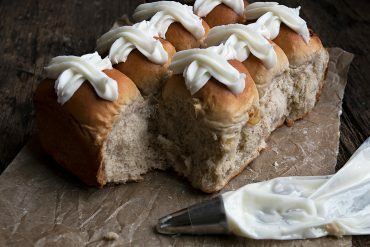 This looks divine – so fluffy and light! Love the blackberries and almond flavour. Bless you for providing gram weights – can’t tell you how much I love finding recipes with proper weight measurements. Oh, and that cake looks perfect: summery and delicious. Thank you from London, UK. Thanks so much, Evie. I try to provide metric measurements when I can! 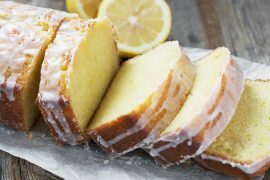 This cake looks so delicious and moist! This looks so perfect for summer! What a beautiful cake. 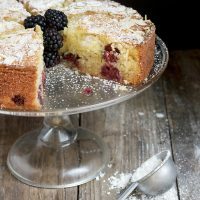 I love the idea of blackberry and almond before – I don’t believe I have ever had them both together! Thanks :) I loved the blackberry and almond together! I baked this cake with raspberries and blueberries a few days ago and had it for breakfast, it was wonderful ! very moist indeed, and it kept pretty well for 3-4 days — it could perhaps have lasted a little longer if my boyfriend hadn’t eaten 3 pieces of it on the first day ! Thanks for the recipe ! Why isn’t this on my kitchen table right now? It looks soooo good and I love almond-based desserts. Plus, I just installed an air-conditioner in my kitchen, so I can bake again! Air conditioning is an essential ingredient for baking during a DC summer. Thanks so much Karen and happy (cool) baking! I LOVE LOVE LOVE almonds! So this cake looks to die for! The almond topping by itself is enough of a reason to make this! Oh, and the addition of greek yogurt….. LOVE it. It keeps the cake so moist and light. Great, Great Great, Great recipe and photographs. Mmmm this cake looks delicious! The perfect cake for the summer. I am also hesitant to bake a lot this summer but this cake will be the exception! 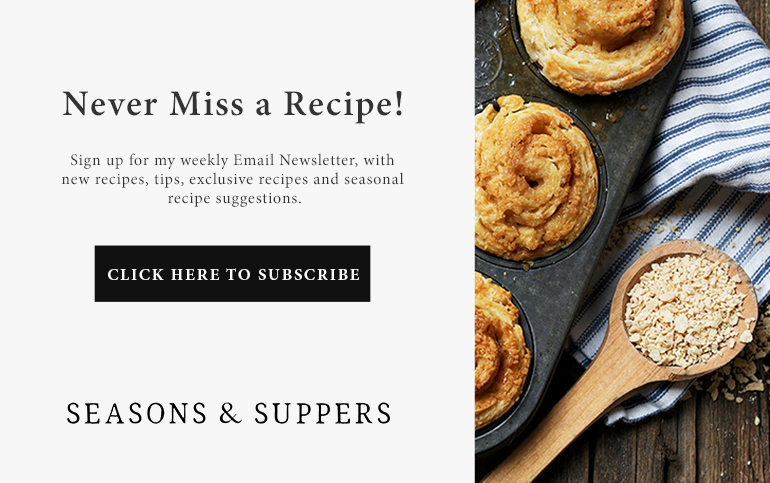 Thanks so much, Linda :) I’m still drooling over your potatoes and was so pleased they led me (from Foodgawker, I think) to your beautiful blog! Just tried this recipe out. So tasty and the perfect addition to my weekend! Thanks Sarah. I think some almond flour would add great flavour, for sure! Your presentation is so beautiful, will be making this cake next week for our week long guests. I know we will all enjoy this very much. Great timing! 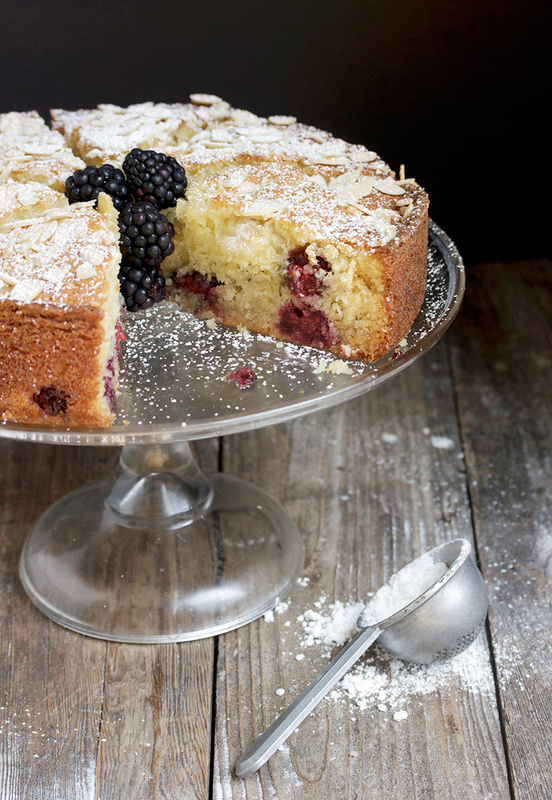 I adore blackberries, what a gorgeous cake to showcase them! 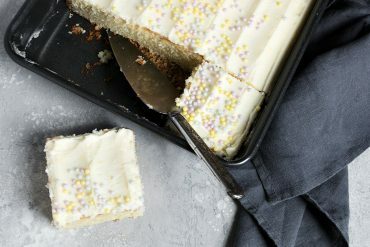 This cake sounds incredible (and looks perfectly moist!) Gorgeous! I love almond based cakes as they are always so moist and delicious. This looks divine and I bet tasted just as beautiful as it’s appearance. I always say that I’m not going to bake in the summer because it’s too hot. But that doesn’t last very long. My need for cake and pies and brownies usually outweighs my heat restrictions! This is just perfect – blackberries and almond and yogurt = all my favs! Jennifer please do not stop your baking or I don’t know what I’ll do! Some of my favorite desserts are from your blog and this cake will also be added to my favorites list! Absolutely lovely! Thanks Mary Ann :) And I’m sure I’ll never stop! Baking in summer is essential! It’s the best way to use up summer fruit – definitely trying this cake, girl! You had me at moist. And then you had me at almond. And blackberry. I love everything about this! 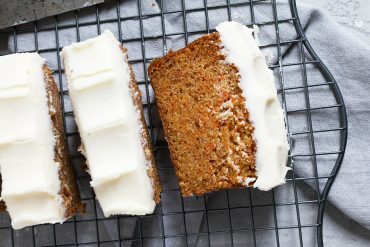 I’ve just started baking with Greek yogurt and I’m loving the results! Thanks Sue. I love baking with Greek yogurt. It adds a lot of moistness, for sure! Mmm that sounds scrumptious! 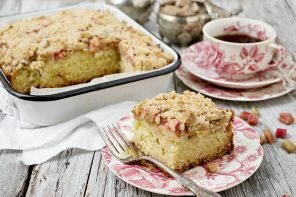 It looks very buttery just by the pictures :) Love the almond topping! Thanks June and yes, it buttery and moist, but somehow still really light! I am seriously drooling Jennifer. I love how moist this cake is and how simple. That’s a great idea to add the almonds after 30 minutes. 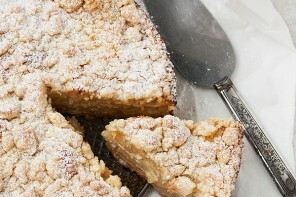 I have that problem sometimes with streusel and I bet your little trick would work great! Thanks Chris and yes, that’s definitely a good trick for streusel, too!